In her column over the weekend, Renee Loth described a pretty fascinating, modern predicament facing policy makers in Massachusetts: cities need to both increase and decrease their use of electric lighting. On one hand, too many city lights sap precious energy, waste money, confuse wildlife, and make it difficult for stargazers to observe our universe's natural beauty. On the other hand, cities have a responsibility to keep their streets illuminated, both for safety and aesthetic purposes. Street lights can deter crime and help drivers steer clear of pedestrians and bikers; architectural lighting can beautifies monuments and landmarks, making a city more attractive to tourists and residents alike. Massachusetts isn't alone in facing this problem—every metropolitan area on the planet has to grapple with them. But, when compared to other New England states, Massachusetts does deal with light pollution uniquely: by doing nothing. Connecticut, Rhode Island, Maine, New Hampshire, and Vermont have all passed statewide measures regulating the use of outdoor lighting. Massachusetts, on the other hand, has chosen to let the tensions work themselves out on their own. 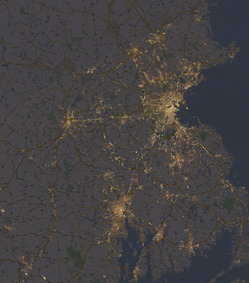 The stark contrast is made clear on The New England Light Pollution Advisory Groupâ€™s website. A quick browse reveals that Connecticut has three strong outdoor-lighting regulations on the books; Maine was among the first states nationwide to enact regulations requiring fully shielded outdoor lighting on projects funded by the state; New Hampshire has established policies protecting its skies as a â€œcultural asset important to rural character and the tourism industryâ€�; the Rhode Island legislature passed its "Outdoor Lighting Control Act" in 2002; and in Vermont, a 20-member legislative outdoor-lighting advisory board has created a set of performance-based, outdoor-lighting guidelines for the state. That never happened. In fact, during the 2009-2010 legislative session, six outdoor-lighting bills were introduced, but none of them made it to the floor of the House or Senate for a vote. No one has yet been able to put a finger on why Massachusetts has responded to light pollution differently than other New England states. Kelly Beatty from the New England Light Pollution Advisory Group thinks part of it can be chalked up to lobbying by the National Electrical Manufacturers Association (NEMA), an organization that opposes the measures. NEMA has argued that modifying lights along Massachusetts roads would cost money--and "'costs money' is the death knell for bills in the State House these days," Beatty said. That may be true, but it still doesn't answer why NEMA hasn't had success blocking measures in other states.